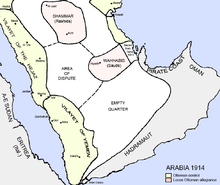 Following the collapse of the Ottoman Empire in 1918 after the Great War, northern Yemen became an independent state as the Mutawakkilite Kingdom of Yemen. On 27 September 1962, revolutionaries inspired by the Arab nationalist ideology of United Arab Republic (Egyptian) President Gamal Abdel Nasser deposed the newly crowned King Muhammad al-Badr, took control of Sanaʽa, and established the Yemen Arab Republic (YAR). This coup d'état marked the beginning of the North Yemen Civil War that pitted YAR troops, assisted by the United Arab Republic (Egypt), against Badr's royalist forces, supported by Saudi Arabia and Jordan. Conflict continued periodically until 1967, when Egyptian troops were withdrawn to join the conflict of the Six-Day War. By 1968, following a final royalist siege of Sanaʽa, most of the opposing leaders reached a reconciliation. Saudi Arabia recognized the Republic in 1970. Unlike East and West Germany or North and South Korea, the YAR and its southern neighbor, the People's Democratic Republic of Yemen (PDRY), also known as South Yemen, remained relatively friendly, though relations were often strained. In 1972 the two nations declared that unification would eventually occur. However, these plans were put on hold in 1979, and war was prevented only by an Arab League intervention. The goal of unity was reaffirmed by the northern and southern heads of state during a summit meeting in Kuwait in March 1979. In May 1988, the YAR and PDRY governments came to an understanding that considerably reduced tensions. They agreed to renew discussions concerning unification, to establish a joint oil exploration area along their undefined border, to demilitarize the border, and to allow Yemenis unrestricted border passage on the basis of a national identification card. Official Yemeni unification took place on May 22, 1990, with a planned, 30-month process, scheduled for completion in November 1992. The first stamp bearing the inscription "Yemen Republic" was issued in October 1990. While government ministries proceeded to merge, both currencies remained valid until 11 June 1996. A civil war in 1994 delayed the completion of the final merger. ^ "Constitution of the Yemen Arab Republic, 1970". al-bab.com. Retrieved 8 February 2018. ^ "State Succession and Membership in International Organizations". Google Books. Retrieved 13 February 2018. ^ The United States extended diplomatic recognition to the Yemen Arab Republic (North Yemen) on 19 December 1962, The Times, 20 December 1962.